Update: Oracle Java 10 has reached the end of public updates (see the roadmap here), therefore it's no longer available for download. As a result, the packages in the Linux Uprising Java PPA no longer work. Switch to Oracle Java 11 (which is in the Linux Uprising PPA), Oracle Java 12, or OpenJDK 11 instead. application class-data sharing, which allows app classes to be placed in the shared archive to reduce startup and footprint of Java applications. 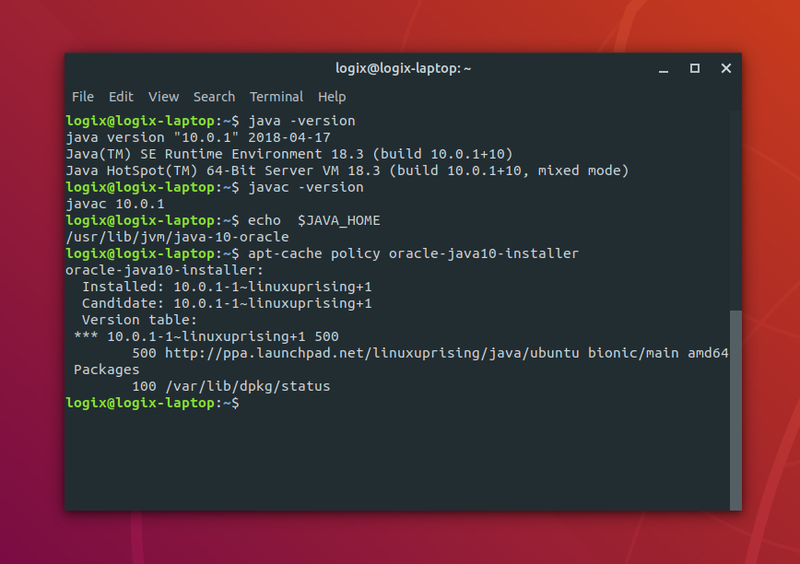 Oracle Java 10 for Linux has been out for some time, and seeing that Andrew hasn't updated the Java PPA (Personal Package Archive) with the new version, I decided to create a single repository PPA for it myself (Oracle Java is the only package in the PPA). My package is pretty much the same as the Java 9 and 8 packages from the WebUpd8 Java PPA, the only change being that it was updated to install Oracle Java 10 (JDK 10). Oracle provides Java (JDK) 10 for 64bit only. As a result, using the Oracle Java 10 package in our PPA will only work on 64bit, so don't try to add the PPA to your software sources or install it on 32bit or ARM because it won't work! The PPA package installs Oracle JDK 10 for Linux, which includes the JRE bin Java folder, so installing this package gets you both JDK and JRE. In some old Linux versions, the JRE bin Java folder was available in JDK, but in a separate folder. This Oracle Java version uses the same folder for all executables, be it JDK or JRE, and there's no need to install JRE separately. For Debian, see the instructions from our Debian Oracle JDK 10 article. The package name is oracle-java10-installer and not oracle-java10-jdk because it doesn't contain any Oracle Java files. It's just an installer that downloads the binary from Oracle's servers and configures everything automatically for you. After adding our Oracle Java PPA to your software sources and installing Java, here's how to make it default. Don't worry though, there's no need to manually run commands like sudo update-alternatives --config java or anything like that. 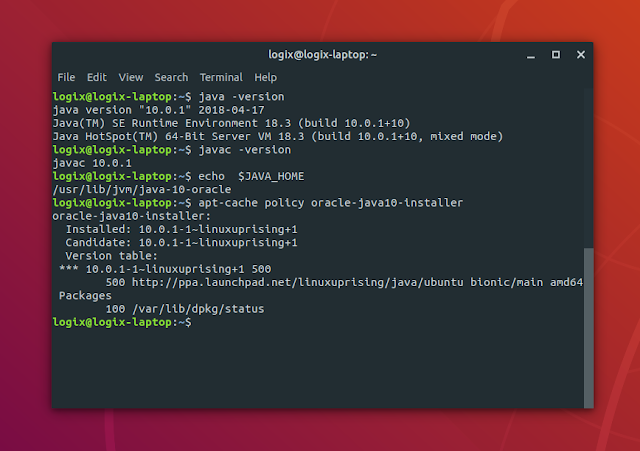 Just like the original package, my Oracle Java 10 package supports installing Java by downloading the archive manually. This is useful in case you're behind a firewall or your ISP somehow blocks the Oracle JDK 10 download link. To do this, download the Oracle Java 10 tar.gz archive and place it in the /var/cache/oracle-jdk10-installer folder. Next, install the oracle-java10-installer package and it should pick up the downloaded tar.gz archive instead of downloading it by itself.